PUNE: International cargo operation from the Pune airport is likely to take off by the month end, airport officials have said. Sources in the customs at the airport told pune-news.com that the clearance and notification from the Bureau of Civil Aviation Security (BCAS) for starting the export of international cargo from the airport was expected soon. "As far as the domestic cargo or freight movement is concerned, it is handled by the officials of the Airports Authority of India (AAI). International cargo operation will be handled by the customs and we are expecting clearance from BCAS by month end or early next month," an official told pune-news.com. If one looks at the figures released by AAI, the airport has scored well in terms of domestic freight movement. The figures of February and January this year fare well when compared with the figures of January, February and March last year. "Pune is a hub of international and domestic cargo originating from western Maharashtra and deserves to have its own full-fledged international cargo complex. There is heavy cargo movement from Pune comprising mainly of aerospace and defence, automotive, chemicals, consumer durables, electronic and electrical, healthcare and pharmaceuticals etc. Unfortunately, lack of required facilities and infrastructure for handling cargo at Pune Airport has resulted in the cargo moving out of Mumbai. It is said that of the total cargo moving out of Mumbai Airport, almost 40% is from Pune. Apart from periodic announcements about providing full-fledged cargo complex and commencement of international cargo movement from Pune Airport, AAI has not been able to do much in this regard," aviation expert and analyst said. "AAI had planned to make Common User Domestic Cargo Terminal (CUDCT) facility available at Pune and few other airports during 2016-17. Had it been implemented, the woes of cargo stakeholders could have been mitigated to some extent. Unfortunately, this facility too has still not been provided by AAI. It is time the chairman of Pune Airport Advisory Committee looks into this long pending demand of industries in the city," officer added. Anant Sardeshmukh, director general of the Marhatta Chamber of Commerce, Industries and Agriculture (MCCIA), however, struck a positive note. "When it comes to domestic freight movement, a majority of people prefer road or rail due to better connectivity. Pune airport is slowly developing itself in terms of facilities and once international cargo operations start, facilities will be added and the interest of people will increase," Sardeshmukh told pune-news.com. The spot located towards the extreme right side of the pre-paid taxi booth has been selected for creation of international cargo export facility. The spot is being developed infrastructure-wise so that the incoming cargo can be properly stored and transported. In January, a team of officials from BCAS visited Pune and met AAI officials. 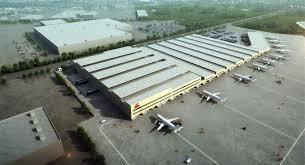 The team had suggested that the airport begin international cargo operation soon. Clearance in this regard has been already been given by the customs.